The Reserve Bank has left the Official Cash Rate (OCR) on hold at 1.75% and continues to say monetary policy will remain accommodative for a considerable period. The comment indicates the Bank is sticking to its forecast for the first OCR hike to come in September 2019, against economist and market expectations that it might have to move earlier, in 2018. In keeping with its recent attempts to convey a neutral tone on the future direction of the OCR, Reserve Bank Governor Graeme Wheeler said numerous uncertainties remained and that "policy may need to adjust accordingly" - an indication that he would be prepared to cut the OCR if required, but that economic pressure may appear more quickly than the Bank's central pick (read more on that here). In keeping with the script, Wheeler kept to many of the themes in the Bank's last OCR statement in May. He welcomed Auckland house price moderation but warned on supply and demand imbalances. He indicated annual CPI inflation is expected to return from a blip of 2.2% in March back towards the 2% mid-point of the Bank's target range. "Global economic growth has increased and become more broad-based. However, major challenges remain with on-going surplus capacity and extensive political uncertainty," he said Thursday. In May, the line was only different by way of inclusion of "over recent months" at the end of the first sentence. Keeping on the global theme, Wheeler added: "Headline inflation has increased over the past year in several countries, but moderated recently with the fall in energy prices. Core inflation and long-term bond yields remain low. Monetary policy is expected to remain stimulatory in the advanced economies, but less so going forward." Wheeler again took to being dismayed by the rise of the New Zealand dollar. When in May he had welcomed a fall in the trade-weighted exchange rate, today he noted the TWI had risen 3% since last month, partly in response to higher export prices. "A lower New Zealand dollar would help rebalance the growth outlook towards the tradables sector," he said. The New Zealand dollar jumped nearly half a US cent directly following the statement at 9am, although an hour later had lost about half those gains. Kiwibank economists noted the lack of "hard" words in Wheeler's comments about the currency. 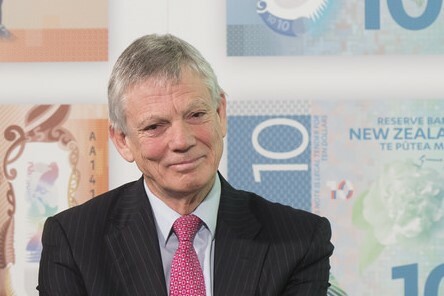 "The language could have been stronger around the currency, for example stating that "a decline in the exchange rate is needed " as they have in previous statements, but it appears that the Bank isn't too perturbed by the rally in the currency given that export prices have also risen," Kiwibank economists said. ANZ economists said there was nothing stern in the Bank's comments on the currency "It’s hard to argue against currency strength when your terms of trade are set to hit an all-time high. Given the NZD’s spike, the market was obviously looking for something more," they said. This was also perhaps due to market expectations that the Reserve Bank may have choosen to be a tad more bearish on New Zealand's growth outlook, following dissappointing GDP figures for the March quarter, which came in well below the Bank's pick. "GDP growth in the March quarter was lower than expected, with weaker export volumes and residential construction partially offset by stronger consumption," Wheeler said. But the important bit: "Nevertheless, the growth outlook remains positive, supported by accommodative monetary policy, strong population growth, and high terms of trade. Recent changes announced in Budget 2017 should support the outlook for growth," he added. On that, Westpac economists said: "the RBNZ remains positive on the outlook for the domestic economy, despite the recent lower than expected March quarter GDP result." ASB economists chimed in: "The fact the RBNZ was relatively unconcerned by weaker Q1 GDP growth potentially took the market by surprise." The Reserve Bank welcomed futher moderation in Auckland house prices (just as it did in May). It kept its warning that while moderation was expected to continue, supply and demand imbalances could see prices take off again. The Bank has recently been warning of the financial stability pressures from a resumption of Auckland house prices. On the all important CPI inflation expectations paragraph, only four words were removed from the Bank's May statement. "The increase in headline inflation in the March quarter was mainly due to higher tradables inflation, particularly petrol and food prices. These effects are temporary and may lead to some variability in headline inflation," Wheeler said. In May, that line had also included "over the year ahead." "Non-tradables and wage inflation remain moderate but are expected to increase gradually," Wheeler continued Thursday. "This will bring future headline inflation to the midpoint of the target band over the medium term. Longer-term inflation expectations remain well-anchored at around 2 percent." However, the Bank did drop one line from its May OCR statement that developments since its previous decision were on balance "considered to be neutral for the stance of monetary policy." On Thursday it went straight from discussing longer-term inflation expectations to its regular comment that monetary policy would remain accommodative for a considerable period. See its full statement below. Earlier in the week, the NZIER shadow OCR board - a group of economists, business people and academics - had indicated a preference for the rate to be left on hold, but indicated the Bank should start shifting more towards a tightening bias. Former RBNZ chairman and chief economist Arthur Grimes said in his shadow board comments that interest rates would have to start rising at some stage over the next year as resource constraints intensify and affect inflation. “It will be important that the Bank does not get behind the curve by leaving rates at very low levels for too long. Otherwise the result will be an overshoot in the other direction,” he said. MYOB general manager Caroline Luey said the RBNZ needed to be clear about future tightening. “We see surging commodity prices pushing heat into the economy, with inflation trending up, leading to building expectations that forecast increases will be brought forward. It would be good to get a clear steer on where things are heading,” she said. And Victoria University professor Viv Hall said he had been shading upwards his probability of an OCR increase. The RBNZ’s OCR Review this morning kept the OCR on hold at 1.75%, maintained a neutral bias, and repeated the message that the OCR is likely to remain on hold for a long time. The key policy guidance paragraph stated: “Monetary policy will remain accommodative for a considerable period. Numerous uncertainties remain and policy may need to adjust accordingly.” This is identical to May’s paragraph. The body of the press release noted the main economic developments since the May MPS, being recent global disinflation, recent slower NZ GDP growth, cooling NZ housing market, Budget stimulus, and temporary uptick in NZ inflation. The Budget stimulus narrative is new. A few minutes ahead of the announcement, NZD/USD was trading at 0.7227. Fifteen minutes later it is at 0.7252. Similarly, AUD/NZD was 1.0452 before and 1.0417 after. The moderate rise in the NZD probably reflects widely held expectations the risks today were skewed slightly in a dovish direction; in the absence of any dovish surprise, NZD was bought. Swap rates were unmoved, the 2yr at 2.21 and the 10yr at 3.15. The implications of today’s announcement for market pricing should be neutral. As widely expected, the RBNZ left the OCR unchanged at 1.75% this morning. With the on-hold decision unanimously expected by analysts, the focus was squarely on the wording of the accompanying one page statement. Again the Bank left its final paragraph unchanged - saying that "Monetary policy will remain accommodative for a considerable period. Numerous uncertainties remain and policy may need to adjust accordingly." Several paragraphs in this morning's statement were cut and pasted from the May MPS but the Bank also noted some of the key data points we have seen over the last month. On the growth outlook, the Bank noted the weaker GDP data from the March quarter but stated that the "growth outlook remains positive, supported by accommodative monetary policy, strong population growth and high terms of trade ." This was a shift in drivers from those mentioned in the May MPS, moving away from a focus on construction activity as an underlying growth driver in response to the recent slowdown we have seen in building work. In addition, the Bank acknowledged that the recent Budget announcements which lifted fiscal spending, will also provide further support for economic growth. Comments on inflation were identical to the May MPS, with the Bank anticipating some volatility in inflation data over the year ahead before a gradual return to the midpoint of the target band (i.e. a 2% inflation rate). On the exchange rate, the Bank noted that the currency has in party moved higher due to recent gains in export prices. If the Bank believes the recent rally has been caused by more positive underlying fundamentals then the rebound can be 'justified'. However, the market was expecting stronger language on the exchange rate and failure to deliver that has sent the NZD higher against most major trading partners, with the NZ TWI rallying to 78.50. The RBNZ today maintained a very neutral tone, giving themselves plenty of time to see how economic data progresses over the year ahead. We expect to see investment activity improve toward the end of the year and the economy to remain supported by migration-driven population growth (absent any major changes in government policy), solid domestic consumption, strong export commodity prices and accommodative monetary policy. While we agree that the Bank has time on its side, we still see a rate hike earlier than the RBNZ's projections suggest as inflation pressure builds and major global central banks continue to move toward tighter monetary policy settings. We expect to see gradual OCR hikes commence from November 2018, about a year earlier than the RBNZ's view (second half of 2019) but slightly later than market pricing implies (August 2018). With the on hold decision, the focus was on the wording of the statement and the lack of 'hard' words on the recent rebound in the currency saw the exchange rate jump higher following the statement. The NZD/USD moved from $0.7224 to $0.7250 and the NZ TWI has moved even higher, up to 78.50 now. The language could have been stronger around the currency, for example stating that "a decline in the exchange rate is needed " as they have in previous statements, but it appears that the Bank isn't too perturbed by the rally in the currency given that export prices have also risen. In terms of local interest rates, the reaction was much more subdued with the 2-year swap rate continuing to trade around 2.20%. No change and a similar tone to that expressed in May. The RBNZ’s clear neutral stance remains. We still hold the view that the RBNZ will likely tighten next year, given our belief that the economy will grow at a rate that will gradually eat into capacity. However, the RBNZ is some way away from embracing that mind-set. It will not react until it sees broad-based inflation. As expected, the RBNZ left the OCR at 1.75% this morning, and maintained a clear neutral tone.Importantly, but unsurprisingly, the RBNZ reiterated that “Monetary policy will remain accommodative for a considerable period”. There were some tweaks in the language, but by-and-large, the message and tone were similar to the May Monetary Policy Statement. The RBNZ is mindful of the uncertainty facing the global growth and inflation outlook; it maintains a positive view towards domestic growth (despite the latest GDP disappointments – which it appears to be looking through, as are we); it is watchful with regards to housing; and while it expects inflation to settle at the target midpoint eventually, it does not really appear convinced on that front yet. There are a number of moving parts, but caution prevails. It’s still softly jawboning the NZD. Following a little more comfort in May, the RBNZ has acknowledged that the NZD has risen since then and believes that “a lower New Zealand dollar would help rebalance the growth outlook towards the tradable sector”. There is nothing stern in this and it’s hard to argue against currency strength when your terms of trade are set to hit an all-time high. Given the NZD’s spike, the market was obviously looking for something more. We are still left with the clear impression that the hurdle for policy action (in either direction) remains high. The RBNZ continues to see “numerous uncertainties” shaping the outlook and is hesitant to act (or to even signal likely future action). And we suspect that will remain the case for a while yet. Most importantly, we doubt the RBNZ will be ready to embrace a tightening mind-set until there are clearer signs that domestic inflation is broadening beyond just housing. We believe the underlying pace of economic momentum is such that spare capacity is gradually being absorbed. The labour market is critical to watch at present. We think it’s tightening, with wage growth set to gradually accelerate, providing a push to inflation. At some stage that will require a shift to an explicit tightening stance by the RBNZ, but we are a long way from that point. Instead the RBNZ’s focus is on evidence that actual inflation is picking up and broadening. We’re simply not seeing that at present. Our Monthly Inflation Gauge will provide timely signals on the underlying pulse. We’re sticking to the view the OCR is likely to move up in mid-2018, but that’s still a long way off. The RBNZ left the OCR on hold at 1.75% as widely expected. The focus was on the tone of the statement, which was still neutral and reiterated that policy was to remain accommodative for a considerable period. We continue to expect the RBNZ to remain on hold until late 2018. The RBNZ remains upbeat on the growth outlook despite the weaker Q1 GDP outcome. While the RBNZ’s language around the higher NZD remained factual and similar in tone to previous statements, some market participants may have been looking for a stronger attempt to talk the currency down. The NZD lifted following the release of the RBNZ OCR Review, as the statement was not quite what some participants in the market had positioned for. In particular, the NZ Trade Weighted Index has risen around 3% since May and markets were likely expecting the RBNZ to take a more hard-line approach to this development. Instead, the RBNZ merely noted the lift, but refrained from stating that the NZD was unjustifiably high. However, the RBNZ’s matter-of-fact NZD dollar comments were in line with our expectations as economic fundamentals (such as higher export prices) are responsible for some of the recent strength. The market reaction also likely reflected the fact that the RBNZ largely discounted the recent weakness in GDP growth. Instead, the RBNZ remains upbeat on the growth outlook, noting that the high Terms of Trade and Budget 2017 will be supportive of growth going forward. The RBNZ remains upbeat on the growth outlook despite the weaker Q1 GDP outcome. The RBNZ added high Terms of Trade as a driver of stronger growth, along with low interest rates and population growth. In addition, the RBNZ said Budget 2017 (released after the May MPS) would also support the growth outlook. We are also upbeat on the medium-term growth outlook. However, the fact the RBNZ was relatively unconcerned by weaker Q1 GDP growth potentially took the market by surprise. What was missing from our perspective was a comment on Fonterra’s upbeat milk price forecast for the upcoming season. We believe the RBNZ’s May Monetary Policy Statement (MPS) assumption about milk prices was conservative and thought that Fonterra’s upbeat view may sway the RBNZ to revise this higher. At the May MPS we saw dairy prices as a key source of upside risk to the RBNZ’s consumer spending and investment forecasts. While the RBNZ did refer to high Terms of Trade, there was no explicit reference to dairy prices in the June statement. At this juncture, our more optimistic dairy view partly explains why we expect a sooner start to the RBNZ’s tightening cycle. The RBNZ’s view of the inflation outlook remained unchanged from the May MPS and OCR Review. The RBNZ reiterated that the Q1 strength was largely due to temporary rises in petrol and food prices and that inflation was likely to be volatile over the next few quarters. This is in line with our view and we are expecting inflation to dip back below 2% in Q2 as the recent falls in oil prices weigh on tradable inflation. Looking forward, we expect tightening domestic capacity pressures and improving global growth to lift inflation back towards the 2% mid-point of the target band by late 2019. The RBNZ remains wary of the Auckland housing market, despite noting that house price growth had moderated further. The Bank again acknowledged that the ongoing imbalance between demand and supply means a price resurgence in the market remains a risk. "Extensive political uncertainty" - is that RBNZ speak for a govt where the PM is part of a police coverup? No. It hints that there is an election coming up so who knows. UK elections have changed the landsape, Brexit negotiations have started, Trump is still Trump. What cover-up Smalltown ? The PM gave a statement to Police at the time , that action does not look like a cover-up to me . Doesn't sound like a police cover up to you Boatman or do you believe that politicians can be treated different from the plebs?? It's the catch-all "Chicken Little" BS. Well, another nail in the coffin of the " Housing Crash !! " The last nail will be "NATs winning the election" ... I think October started to feel already Hot !! What!? Why are you acting like this was unexpected!? After the Fed increase their interest rates last week and the recent indications that the housing market in Auckland is slowing by itself, NO ONE expected the RBNZ to move. Especially with NZD so strong. The RBNZs remit is to maintain stability not cause a crash. M. Aurelius I was just waiting for RBNZ to hurry up an make the announcement so I could buy AUD cheaper. Bought AUD at nine this morning.great rates!! The mandate for all central banks now, is to prevent deleveraging. We all know how damaging deleveraging is to the economy, and I for one am glad that globally central banks have the power and mandate to prevent deleveraging in all it's destructive forms. The housing crash is just starting, and it doesn't need an OCR increase to carry on. People are addicted to debt and have no self-control. Wheeler smiling like a boss! Let's hope so, since the financialised economic train wreck the majority of citizens endure now has to be vanquished by any means available. I'm fine with a slow ratcheting up of the interest rates to find our way out of this disaster. What I think will undermine it is the Fed will increase rates only to decrease them to 0% again, and the other major central banks will just keep the printing presses rolling. If the OCR doesn't go up by at least 25 bps this year we're not going to reverse the debt mania that's going on right now. MYOB general manager Caroline Luey said the RBNZ needed to be clear about future tightening. “We see surging commodity prices pushing heat into the economy, with inflation trending up, leading to building expectations that forecast increases will be brought forward. The net result 9 our of 10 times of speeches by Wheeler is that the dollar rises. When the country is crying out for a lower TWI I wonder, is this a deliberate strategy by him or is he out of his depth? I don't entirely agree with your point but I love the analogy! Thumbs up from me! I just feel creativity should be rewarded. OCR remains the same but the Kiwi$ does an kangaroo jump ? I really don't understand this . Low interest rates are designed to keep the populace borrowing ( or what else are they for!). We don't have the funds to lend out of our own, so we have to import them. That means foreign funds are borrowed, sold and the NZ$ IS BOUGHT to achieve the misguided aim that the RBNZ has. I understand the dynamic around interest rates and the currency , but the currency should only strengthen when rates go up and lenders get a better return . Read up on the expectations hypothesis and endo/exogeneity. That will make it clear as to why this has happened. Our interest rates are relatively high. The sums borrowed pale in comparison to fx volumes. Be careful not to live too much in the past Cowpat. After operating at a spread of around 200bps above US rates, we're currently not much more than 50bps now, and likely to be less still if the Fed hikes again in Dec which is a fair chance given the Fed's dot plots. The NZD's being driven higher by a weak USD and a better overall economic performance that the US that arguably suggests that NZ's rates shouldn't be at 1.75% - time will tell on that front. The OCR is just one of many factors to influence our exchange rates. Just consider our cross rate with Sterling. Our $ has strengthened considerably,not because of any changes in the OCR,but in response to political events in the UK. When I woke up I had a look at the Australian dollar and it was down. It looks like speculators were expecting bad news. The jump after the announcement put it back to where it should have been. The GBP is performing badly due to all the brexit news. Are people actually making rational decisions or trading on sentiment? I think it's sentiment. Totally agree, I remember rational decision making. I hope we get back there sooner rather than later as the journey back is always harder the further you go. But all bets are off from me at this point. While the TWI is at 75+ and net immigration at 70k+ the OCR is going nowhere. For how many years now have economists been bleating on about inflationary pressures coming from stretched capacity and the labour market to no avail?